Welcome to the ‡Khomani San website. Our story is a long one that started many thousands of years ago when our ancestors still moved freely across southern Africa, following the rains, the plants and the animals that brought us life. Things today are different and the vast open spaces that we once inhabited have become much smaller, intersected by state boundaries, private property and modern man’s infrastructure, such as roads. Nevertheless, a visit to the Kalahari still provides a sense of freedom that is hard to find in many other parts of the world. The sky is big, the horizons unending and there is a timeless peace that can only be found far away from the rush of modern life. 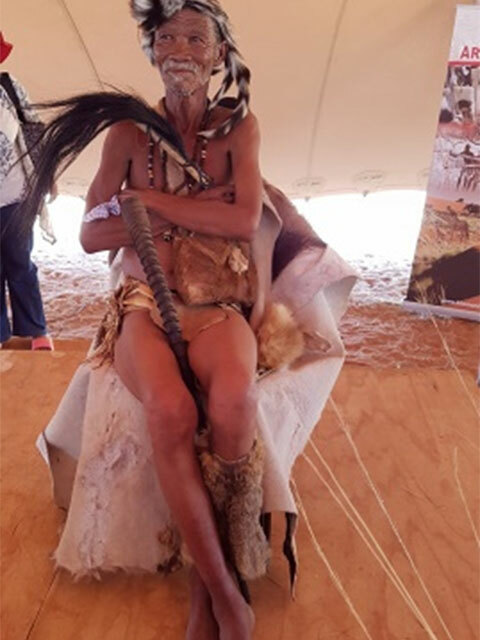 People of the Kalahari are hardy and whilst life has changed here, as elsewhere, our unique way of life can still be experienced and enjoyed and we would like to welcome you to our world. Strip away the trappings of the 21st Century and expose your being to alternative joys of life. This site is intended to be of service to people wanting to learn more about the ‡Khomani San, where we live and what our culture is about. It is for people who would like to visit us and who would like more information to assist in planning and booking such a trip. It is also for people who would like to get involved in making a difference to the community’s life, either through making a donation to a project of their choice, or through getting involved in a deeper way.